The Algerian Football Federation were the subject of criticism having only scheduled two pre-tournament friendlies. In retrospect, booking just the couple of matches limited opportunities for coach Vahid Halilhodzic to exercise different tactical schemes, but one beneficial aspect of playing twice is greatly reducing the risk of injury. Romania are a primarily defensive outfit, while Armenia’s were more inclined to attack. The contrast in styles paid off as Algeria solidified two main tactical schemes: A 4-3-3 counter-attacking game plan, with a low bloc and speedy wingers; and a 4-2-3-1 formation that focused on monopolizing possession and creating goalscoring opportunities. The 4-3-3 was used against Belgium and Germany, while the 4-2-3-1 proved a success against South Korea and Russia. Halilhodzic’s coaching was proactive in the sense that he prepared tailored game plans for each of Algeria’s opponents. Nevertheless, the Bosnian caretaker faced criticism at home for his counter-attacking tactics against Belgium and Germany, which are unorthodox in Algerian footballing tradition, and there were also questions on Algeria’s fitness levels as the North Africans had the tendency to drop in the second half of matches. Notwithstanding, Halilhodzic leaves Brazil with his head held high. He used 19/20 different outfield players, nearly executed preparatory tactics, and took Algeria to unprecedented heights. For that, he deserves the utmost respect. Algeria’s defence struggled to exorcise old demons as they didn’t handle crosses from the flanks and failed to shackle dynamic forwards. Of the 7 conceded goals, 4 came from crosses launched into the box. Dries Mertens, Son Heungmin, and Andre Schurrle all caused the rearguard problems with dynamic movement and lethal finishing. Defending from lateral positions is one weakness Christian Gourcuff must address before the 2014 Africa Cup of Nations. Midfield – ✮✮✮✮ Carl Medjani and Nabil Bentaleb formed a formidable double pivot, fulling of energy and industry. In fact, after three matches played, no other player in Brazil ran more than Bentaleb off the ball. Medjani’s musculature compensated, for the Tottenham midfielder’s slight physique in tackles and aerial duels. Yacine Brahimi orchestrated attacking moves in front the double pivot with formidable efficiency, nothing a goal and two assists. 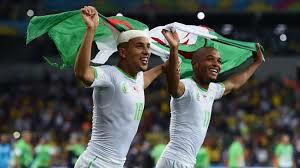 Attack – ✮✮✮✮ Algeria scored 7 goals in 4 matches and scored in every single of their matches. At its best, the Algerian attack was an irresistible, free-flowing barrage of incursions, fashioning opportunities at will. After a goal against Belgium, however, the Algerians retreated into a defensive shell, desperately clinging to a single-goal lead that inevitably slipped away. Another negative point was end product against Germany, though it was made to look worse than it was due to Manuel Neuer’s sweeper-keeper heroics. There are several legitimate candidates that stood out for Les Fennecs. Islam Slimani scored two goals and was a constant menace to opposing defences. Sofiane Feghouli was the only outfield player to play every minute of the tournament, not allowing fatigue to temper his passion or leadership. But Algeria’s undoutbted player of the tournament has to be Rais M’Bolhi. The CSKA Sofia man impermeably marshalled Algeria’s cages, making decisive stops in each of their four matches.